When I was growing up, kids at my school were far more likely to be taking a typing class than learning how to code. But computers have become such an integral part of our lives – from the powerful smartphones in our pockets to the Internet sites we use to get our information to our increasingly interconnected smart homes – that it is impossible to imagine life without them. And for our children, developing strong skills in not just using computers, but learning how to create the code that runs them, opens numerous options for their future careers. As a journalist, I regularly use basic HTML and coding tools to produce the content for Techlicious. Friends of mine who run their own businesses have learned to code to keep their websites updated. And if your child has an interest in Science, Technology, Engineering and Math (STEM) fields, being comfortable with coding is a must. Helping kids gain proficiency in coding is the mission of Sphero Edu. Using a simple robotic ball called SPRK+, Sphero Edu offers children of all ages a community where they can engage in fun, collaborative activities that teach them the foundation of coding. At its simplest, parents can help younger kids program SPRK+ by drawing shapes on a virtual canvas in the Sphero Edu app – ideal for kids who haven't yet leaned how to read. SPRK+ will follow the shape drawn. While kids can use the Sphero Edu app and SPRK+ to learn code on their own, the Sphero Edu community is what makes things special. There you will find an ever-growing list of hundreds of ideas from community members and Sphero experts for fun, educational activities kids can engage in. Some use just the SPRK+ robot, while others are full-blown engineering projects and science experiments powered by SPRK+. Kids can go in to find their own projects or parents can assign projects to them in virtual "classes". This video gives you a quick peek what you can use it for. 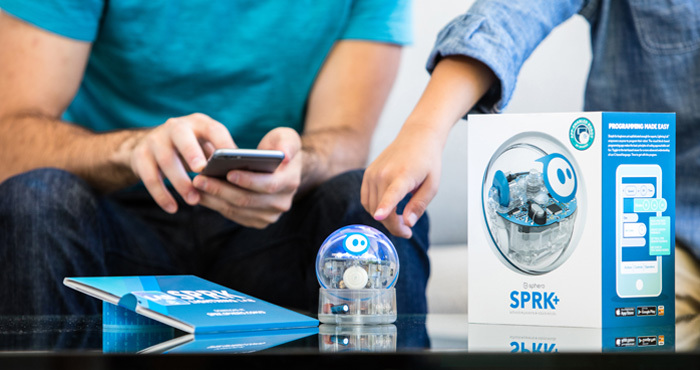 If you're looking to help your child explore his or her interest in coding, you can purchase the Sphero SPRK+ in the Sphero store for $129.99, which includes the app and access to the entire Sphero Edu community. You can download the Sphero Edu app for free in the App Store for iOS devices and Play Store for Android phones and tablets. As a special offer to our readers, we are also giving away a SPRK+ Robot to one lucky winner. To enter, tell us in a comment below how you would use the SPRK+ in your family. The giveaway ends August 18, 2017. See official rules for complete details. This is a sponsored conversation written on behalf of Sphero. My son would use this to develop his coding skills. My grandson has autism and this would be a great tool to help him to learn ! I have five grandsons with two of them being old enough now to appreciate learning these skills and one that isn’t far behind. I love technology and would love to teach that love to my grandkids! I would give this to my granddaughters to get them interested in coding. I’d give to my grandson who is taking coding classes right now! My 10 year old grandson is interested in building robots and other such techie interests. Definitely for my little one who would love to push it to the limit! My nephews would love this I would be the cool aunt if I had this we would have a lot of fun with this. I’d try this with my daughter who is autistic and has a fascination with numbers. Coding looks like something she could excel in and possibly a future career. Id love this for my granddaughter it would help her with learning skills. I would use this with my son. He is so interested in learning how things work. My daughter is on the robotics team, and I she could use this to help with the team. My son would love this! I’d love to help him learn to code. As a fun way to learn new technology, this is excellent. As a teacher, I could use Sphero with my students. Thank you so much!! I would give it to my 10 yer old grandson who loves cool gadgets. Would love this for my very techie Son! My grand-daughters are already interested in coding, so this owuld be a great learning tool. My daughter would love this. It would be great to work on coding skills while having fun! My child was accepted to the School of Engineering and Science in Sacramento, but could not attend due to severe anxiety and daily panic attacks. We have no resources other than a set of digital texts and our imaginations. We are on a fixed income and can not afford to purchase something like sprk+, but our child was really looking forward to robotics. We would have fun learning together! I would use SPRK+ and Sphero Edu to start my children’s coding skills. This would be a great way to introduce them to coding and working on develop basic coding skills along with teaching me the basics too. I would use Shpero Edu to get my daughter interested in coding. I would use this to teach my kids how to program. I would teach them the programming aspect by challenging them to teach sphero new commands. I would use this to teach myself, and my children how to program! “How you would use SPRK+ and Sphero Edu with your family to develop coding skills?” I would use this carefully and wisely, so as to promote good, and not evil! I would love to learn how to code with my younger brother! I have always wanted to learn to code, but as a 20-something year old woman, I have been embarrassed to pick it up, for fear of looking inadequate in a male-dominated field. I have a 13 year old brother who I really think would bond with me over this. He has the original sphere product, and loves it! Thank you for the chance! I would use this to teach my daughter about coding! My nephew and I would learn coding together. I would use Sphero to help my son gain interest in coding. To help teach my kids. my husband is really good at coding and i think sphero would be a fun way to show the kids his passion in something fun for them. I would use this with my nieces and nephews and we could learn together. I would introduce it to them and get them excited about coding. This would make an awesome gift for my nephew and niece who are just starting out on computers! They’d love to learn with this! Thanks! I have two young boys. I have two young boys. This would be an excellent teaching opportunity for them! My daughter has a learning disability. But she excels in math. I want to keep encouraging her, and this would be a great way to introduce her to coding.she would absolutely love this! Thank you for the chance, good luck everyone!!!! My 7 year old insists he is going to be a video game programmer and computer programmer when he grows up. He would love this.